Have you ever been stuck in the middle of the woods with no way back to civilization, no laptop, and your boss expects you to deliver a spectacular presentation to your investors in 15 minutes? Neither have I, but it could happen – life is full of surprises like that. If you ever do find yourself in this situation, all you need is your smartphone, a half-decent wireless connection, and the latest version of Google Slides. 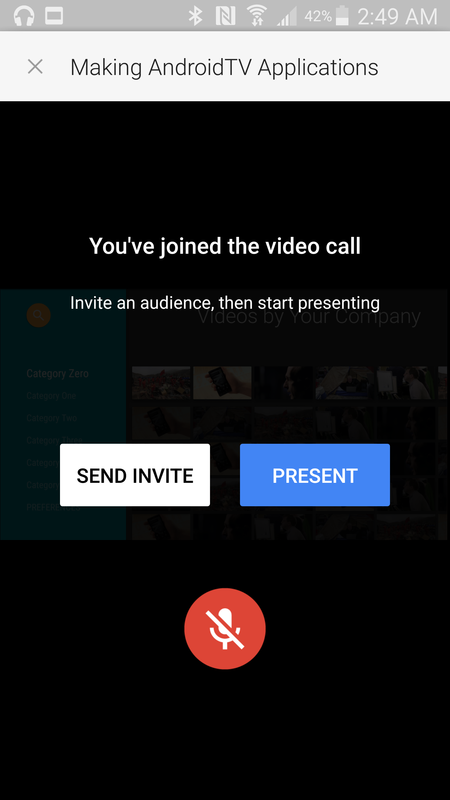 Yesterday, Google began rolling out an update to its presentation app with the capability to run your deck over a Hangouts call. A teardown also reveals that spellcheck is probably right around the corner. 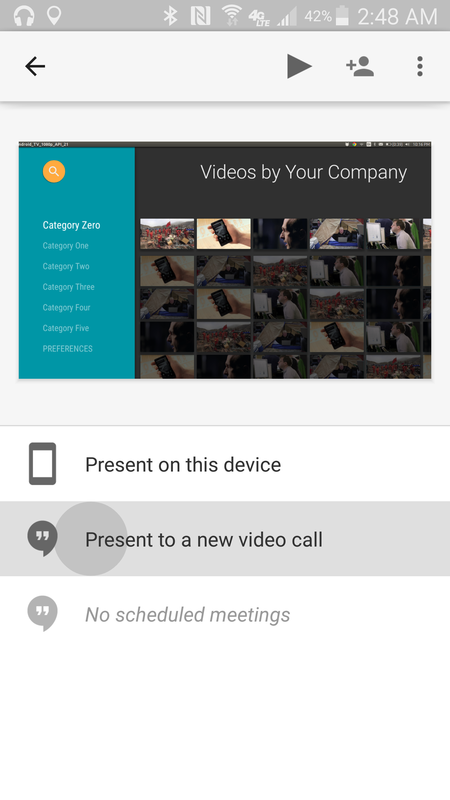 Presentations over Hangouts turned up in an APK Teardown back in April. To get things rolling, just tap on the Start slideshow button while a slide deck is open. Instead of launching directly into the slideshow like previous version, a selector will pop up with an option to start a new video call, at which point you can invite people to join. If you happen to have any scheduled meetings coming up, those will also be listed, making it easier to get participants on the line. Once your presentation is running, a view of your current slide is visible along with a slide counter, timer, and any notes you've prepared in advance. 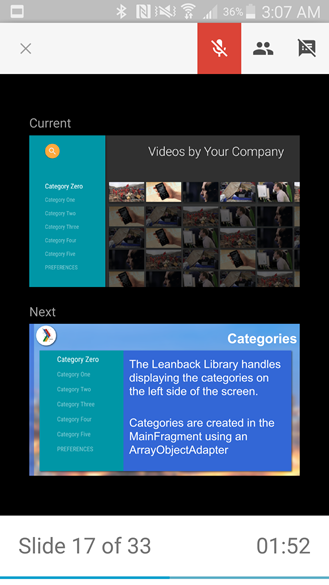 The notes can also be toggled off to get a view of the upcoming slide. While the presentation is running, there will also be a status icon in the notification shade with a live timer. 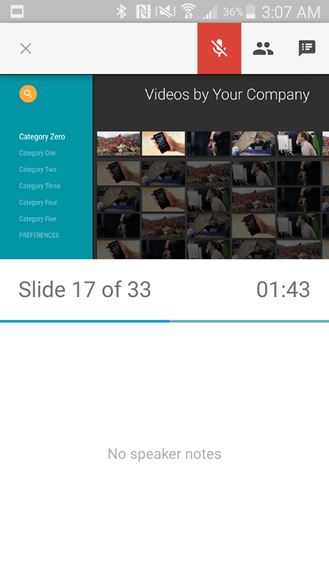 There's also a new animation that appears each time Slides starts up. Just after the splash screen gives way to your list of slides, a small bar moves up from the bottom of the screen to give a reminder of which account is currently active. The same animation is likely to appear in Docs and Sheets when they are updated, as well. Early this year, Docs and Sheets were given the special treatment with real-time spellcheck. Oddly, Slides seems to have been left out of the party. This little omission has probably put a few people into embarrassing situations as a typo or misspelled word slipped through the cracks. There's no fixing the past, but it looks like this kind of thing shouldn't be a problem in the future. Based on some new strings in the app, it looks like a proper spellcheck function is coming to Slides. There's no sign that spellcheck is live, but it looks like it could be. 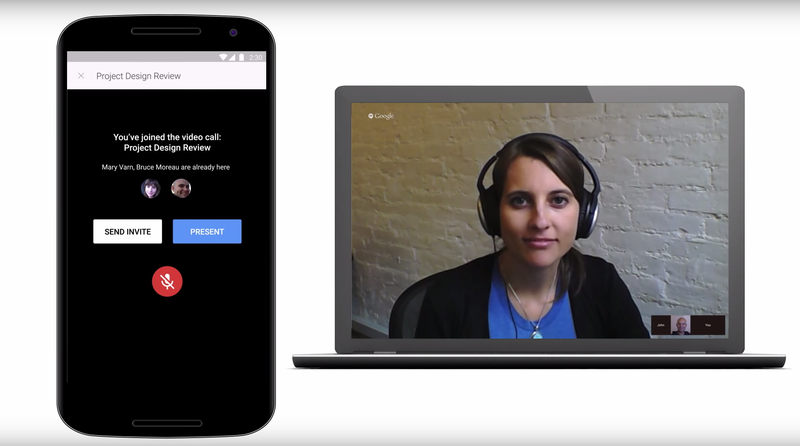 Keep an eye out, because it may very well turn up after Google flips a server-side switch. The same strings turned up in the just-released version of Sheets. I suspect Docs will receive the same treatment when its update eventually comes out. This suggests there will be a new and consistent UI for spellcheck in the near future. After putting in so much time and effort to kill Quickoffice, the last thing I ever expected to see was its launcher icon – but here it is. Yes, the Quickoffice icon turned up in Slides. I don't know why it's here or if it's actually going to be used, but it's real. I wouldn't suggest any high expectations, this icon could be in the apk for a help screen or to welcome users over that have somehow not made the transition yet. Nevertheless, keep an eye out for it to appear somewhere.